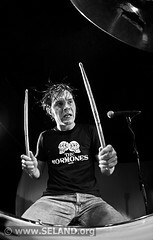 Drummer + fisheye = true! Slim Slammer, Los Plantronics and Simen Mormone, The Mormones. Click for larger images at Flickr (I’m going to install Shadowbox one day). This entry was posted in Music, Photography and tagged b&w, concert, drums, fisheye, Los Plantronics, Mormones on 2008-12-03 by Espen Stranger Seland.